The below script installs the DataStax distribution of Cassandra 3.2.x and the latest Oracle Java 8 on Debian. Copy and paste the script into a file called install_cassandra.sh and execute it as root. Change the version 3.2 on line 12 to match the version you’d like to install. Then connect to the local Cassandra instance run the cqlsh tool. MongoDB is one of the leading noSQL breeds of database that’s been growing in popularity in recent years. The database is available in a ‘community edition’ that’s available for all to use freely. The database setup and install is mostly straightforward however there are a few steps you have to take to get a MongoDB instance up and running. The binaries aren’t shipped by the common Linux distributions so you’ll need to add the apt repositories hosted by mongodb.org. After installing the binaries there are a few config options that can be helpful to start with that are not contained in the default MongoDB install. First off, create a file on your server called install_mongo.sh and copy the content of the script into it found in the below link. Then make the script executable and run it. Once the script completes you’ll be able to connect to your MongoDB instance with admin/ admin. Add the apt repository from mongodb.org and associated key. Install the full mongo-org package containing these packages: mongodb-org-server, mongodb-org-mongos, mongodb-org-shell, mongodb-org-tools. Enforces the wiredTiger storage engine. Enables remote access by listening on ALL interfaces. Enables replication, even if it’s just a stand alone node. Initiates the server as a replication cluster. Adds a user for administration called admin with password admin. The below script installs MongoDB 3.2.x on Debian. Copy and paste the script into a file called install_mongo.sh and execute it as root. echo "Setting up default settings"
portability – the storage isn’t tied to a machine and can be moved with relative ease. scalability – more machines can use the storage as required. This tutorial will focus on a small scale Ceph setup, fit for something like a Raspberry Pi or low resource VPS. We’ll use 3 machines but you could easily add more machines if your scenario requires it. If you are looking for a larger setup, then see this blog post on installing Ceph. 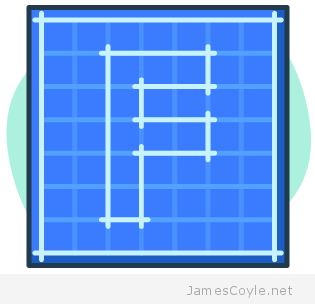 The above diagram shows the topology of the layout. Each machine will have a file /ceph-file that will be mounted as a block device on /dev/loop0 and that’s the space that will be assigned to Ceph. Ceph will replicate any data stored to the file and ensure the data is available to all Ceph clients. The Ceph storage will be accessed from a mountpoint at /mnt/ha-pool. The first step in creating a Ceph storage pool is to set aside some storage that can be used by Ceph. Ceph stores everything twice, by default, so whatever storage you provision will be halved. For this example we’re going to use a file created with dd as the Ceph storage device, however you could use a drive mounted in /dev/ if you have one. A whole drive is by far the preferred solution, however as I’ve stated, the main goal of this post isn’t just performance. If you’re going to use a file for storage, follow my post on creating a block device from a file and mount it on loop0. Otherwise you can continue to the next step. OpenVZ: if you’re using Ceph inside of an OpenVZ container, make sure you pass the loop device through to the container. At this point it’s worth noting that Ceph, in addition to the application requirements, will use approximately 1MB of RAM for each GB of storage provisioned. This means that 1TB of provisioned storage (which in today’s world is rather small) would take 1GB of RAM plus the requirements of running the Ceph daemons. For our low memory footprint, only provision the storage that you’ll need. SSH Keys are set up between all nodes in your cluster – see this post for information on how to set up SSH Keys. For security it’s good practice to set up a new user on all machines you’re going to install Ceph onto and use it to run Ceph. The key should also be copied to all machines using the ssh-copy-id command. The following commands are for installing Ceph on Debian (wheezy) and should be executed on all machines that need to run Ceph. In our example, these commands will be executed on Server 1, Server 2 and Server 3. Next let’s update our apt cache and install Ceph and a few other bits. The next step should be done on just one of your Ceph machines. This will create the monitor service and make each machine aware of the other machines running Ceph. The command references each machine you’re going to be running Ceph on by hostname or DNS entry. Before running the command, make sure that all of your machines resolve via DNS or hosts file. Because I’m only running this in a lab, I’ve used the hosts file route and added an entry to each machine in the hosts file of all Ceph machines. Add your Ceph machine IP and hostnames. You can test that each machine can see the others by using the ping command. If it works then you should be in business! If you haven’t used your ssh keys since setting them up you may be presented with the following warning. Just type yes to continue. The authenticity of host 'ceph1 (10.10.10.1)' can't be established. ECDSA key fingerprint is 66:44:a8:90:e2:8e:12:0e:05:4a:c4:93:a1:43:d1:fd. Warning: Permanently added 'ceph1' (ECDSA) to the list of known hosts. We now need to configure Ceph with our low resource settings. These settings are not performance driven, but instead set to minimise system resources. Create the initial mds daemons, monitor daemons and set the proper permissions on the keyring file. ssh ceph1 "chmod 644 /etc/ceph/ceph.client.admin.keyring"
ssh ceph2 "chmod 644 /etc/ceph/ceph.client.admin.keyring"
ssh ceph3 "chmod 644 /etc/ceph/ceph.client.admin.keyring"
At this point it’s good to take a step back and check everything is up and running. We’ve still not assigned any storage to our Ceph cluster so we can’t run it yet, but we should have the monitor daemons running and the cluster configuration be deployed on all servers. Run the below command and take a look at the output. As you can see, three Ceph servers are referenced on port 6789 which is the monitor daemon port number. We’ve got our Ceph cluster, and we’ve got our storage device that we created as the first step, it’s time to put the two together. Run the below commands on the same machine that you ran the above steps on. You’ll need to replace /dev/sda with the block device on each ceph machines that you’d like to use. Note that the block device (sda) does not need to be the same on all machines. You can use a directory as storage for Ceph, rather than a block device. 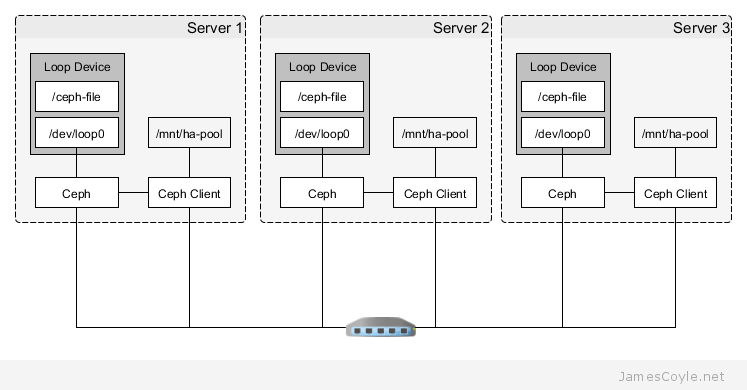 If you’re following this tutorial and creating a loop device to use with Ceph then you’ll need to ensure there is a filesystem on the loop0 device and that it’s mounted. You can skip these next step if you are just using an existing directory. Run the below commands (if you’re using a loop device) on each of the machines that has a loop device you’d like to use. We’re assuming that you’re loop device is loop0. For this example we’ll run it on each of the three machines; ceph1, ceph2 and ceph3. You can use a directory path on the Ceph machine as the OSD device. This may be an option if you’re in an OpenVZ or Docker container that doesn’t allow you to pass through block devices. That’s the server side done! The last step to using our Ceph storage cluster is to mount the cluster to a mountpoint on the local filesystem. Here we’re going to use /mnt/ha-pool as the mount point but you can change that to whatever you’d like. Run these commands on any machines that you’d like to mount the Ceph volume on. First create the mount point where the Ceph storage will be accessible from. Then we need to export the key so that the ceph-client can authenticate with the Ceph daemon. You could turn authentication off, or even create a non-admin user secret but for this tutorial we’ll just use the admin user. Then run the below command to add an entry to your fstab file so that the Ceph volume will be automatically mounted on machine start. This will mount the Ceph volume at /mnt/ha-pool. And that’s it! You have a working Ceph cluster up and running! Before starting, install MariaDB 10.x on a remote host (or local, but that’s less common in a production environment) as we’ll use that later. Create a user for Frappe – here we’ll use frappe but you can change this for anything you like. If you do change the user remember to update the home directory. Set the password for the frappe user with passwd. Install the required dependencies. Notice that we’ve not included an SQL server as we’ll use a remote MariaDB SQL Server. Download and install the latest version of wkhtmltopdf from Sourceforge. Download Frappe from Github as the frappe user. Run the pip installer for Frappe. Create a new Bench as the frappe user. Add the default site configuration file with the remote SQL database hostname/ IP and port number. Before you create any sites, you’ll need to apply a few settings to your SQL server. This guide assumes you have a remote MariaDB SQL Server – log into it and add the below to your my.conf file. And restart your SQL server for the changes to take affect. Copy the Supervisor config file into place so that Frappe automatically starts up with the system. The following script will install the MariaDB Galera Server binaries on multiple servers with a basic cluster configuration. Let me start by saying it’s a quick and dirty script – it may not work in all scenarios and was written on a set of Debian servers. Use it at your own risk! It may work on a MySQL Server cluster but you’ll have to remove or change the repository locations to the MySQL Server ones. Before running the script you’ll need to have SSH key Authentication set up and working between all the nodes. See my post on Create ssh key authentication between nodes for setting up server key authentication. You’ll also need to change a few variables in the script to match your environment. The first variable IP is an array of all the IP addresses you’d like to use to install Maria DB Server. Currently there are 3 IPs specified – replace them with your own IP addresses and add any more if you have more than 3 servers. The other two variables CLUSTER_NAME which is the name MariaDB will use for your cluster; and MAINT_USER_PASSWORD which is the password that will be set for the maintenance user. echo "Setting up repo for $I"
ssh root@$I "apt-get upgrade -y"
ssh root@$I "apt-get install -y software-properties-common"
ssh root@$I "apt-key adv --recv-keys --keyserver hkp://keyserver.ubuntu.com:80 0xcbcb082a1bb943db"
ssh root@$I "add-apt-repository 'deb http://lon1.mirrors.digitalocean.com/mariadb/repo/10.0/ubuntu trusty main'"
echo "Installing DB for $I"
ssh root@$I "apt-get install -y mariadb-galera-server rsync"
ssh root@$IP "service mysql stop"
ssh root@$IP "service mysql start --wsrep-new-cluster"